A while ago, I made a journal post that had some pictures that I'd taken of a jumping spider. My old camera wasn't up to the task, and the pictures were not very clear. But curculio made an interesting comment about them. He said, "The picture you have is probably the equivalent to what their prey might see if they escape." That comment has changed how I look at my less-than-perfect photographs. A couple of days ago, I took a picture of a lizard out at the land. I'm pretty sure it's a Texas Spiny Lizard, but the picture's not very good because the lizard ran away before I could ger very close. When I looked at the photo, I was glad I got a picture, but disappointed it wasn't better. But this morning I noticed how the lizard's coloring blended in with the tree, thought of curculio's comment, and decided it was actually a pretty good photograph. Thanks curculio. If you guys do NaNoWriMo, I'll give it a shot. I'm taking a writing course right now and I feel like the dumbest person in the class. But maybe working on my "novel" will help. I would just pick up where I left off when I was doing it two years ago. I wish I could stand upside down on a wall. I've tried wearing the same color as the paint but that doesn't matter. You have to stand on a tree and wear clothes that match the bark. That was the answer. It worked. Of course, I used spikes but it worked. I think it's an excellent picture. Texas Spinys (yes, this is one) are difficult to photograph well because of their coloring and their tendency to whisk away when you finally get them in focus. My best shots were of a young female who crawled up on a bark-covered stick we'd used to try to build a stool (we turned out to have less than stellar furniture-building skills) and thus put herself on a "model stand" for me. 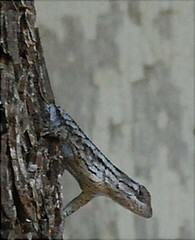 That's the Texas Spiny Lizard picture that is the main image for your Herps gallery, right? That's one of the best Spiny Lizard pictures ever! No, that one was another pure-luck shot. That one was in the back yard and I almost stepped on her: she froze, I had the camera in hand, leaned over, and she turned her head and looked at me.